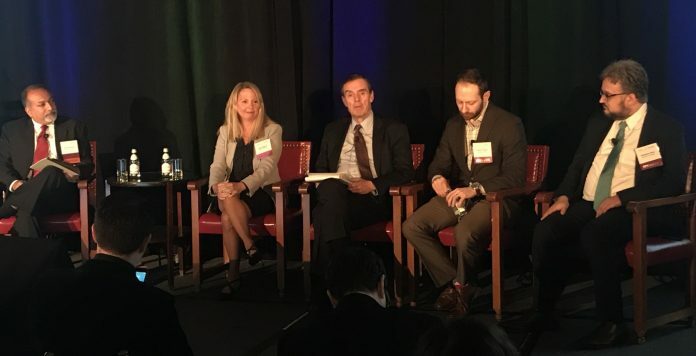 The ability of cell and gene therapy companies to raise capital this year will hinge on their ability to address the manufacturing of their products as well as address medical needs beyond cancer, a panel of three investors and an industry executive agreed yesterday. Speaking at the Alliance for Regenerative Medicine (ARM)’s Cell & Gene Therapy Investor Day, held in New York at the Metropolitan Club, the panelists agreed that the sector is heading for a strong year based on 2018 activity. That activity, according to ARM, included more than $13 billion in global financings and a record-high number of clinical trials (1,028) with a target enrollment of more than 59,000 patients. ARM counts 906 cell and gene therapy and other “regenerative medicine” companies worldwide, more than half of which (484) are based in North America. Patrick Rivers, principal, Aquilo Capital Management, said the most important concern in evaluating companies seeking investment is their manufacturing processes—a longstanding challenge, especially for gene therapy developers dependent on supply of virus. That challenge has led companies to pursue a combination of in-house and outsourced approaches. In the most recent example, bluebird bio today is officially opening its first wholly owned manufacturing facility in Durham, NC. The 125,000-square-foot facility is designed to produce lentiviral vector for the company’s investigational gene and cell therapies. Founded in 2010, Aquilo is a San Francisco firm that invests in drug developers focused on new treatments for urgent medical needs. Companies are less than forthcoming when it comes to their manufacturing, Rivers added. Aisling Capital is a New York life sciences investment firm investing in companies that develop pharmaceutical, biotechnology, and medical products, as well as providers of drug development, manufacturing, and other important services. The need to address manufacturing has created an opportunity for startups focused less on developing cell and gene therapies than on the processes to produce them at scale in the quantities needed by companies, added Matthew Gline, CFO of Roivant Sciences and the panel’s only industry executive. Roivant has raised more than $3 billion toward building its family of 15 companies or “vants” focused on developing therapies for diseases that include uterine fibroids, endometriosis, prostate cancer, Parkinson’s disease, diabetes, sickle cell disease, and multiple rare and fatal pediatric conditions—as well as technologies designed to improve the process of developing and commercializing new treatments. “I think if you want to start a gene therapy company, I think there’s a huge opportunity for like the Illumina of gene therapy, a services company where we (gene therapy developers) don’t have to worry about the manufacturing,” Gline said. Gline cited the example of TriLink BioTechnologies, which serves mRNA therapy developers as a third-party provider specializing in the synthesis of highly modified nucleic acid constructs for research, diagnostic, and therapeutic applications. According to its website, TriLink develops and manufactures oligonucleotides, mRNA transcripts, nucleotides, bioconjugation, custom chemistry, solutions for PCR & RT-PCR, and NGS library preparation kits. Privately-held TriLink was acquired in 2017 by Maravai LifeSciences. However, panel moderator Reni Benjamin, PhD, managing director and senior biotechnology analyst at Raymond James, said many investors he speaks with prefer cell and gene therapy startups to develop their own manufacturing solutions rather than rely on contract manufacturers. More than half of the clinical trials (598 or 58%) recorded by ARM were in oncology. One such example Baum cited was a company DEFTA has invested in, Endogena Therapeutics. Endogena seeks to develop first-in-class endogenous regenerative medicines to repair and regenerate tissues and organs, with the aim of addressing unmet medical needs associated with aging and genetic diseases. Rivers agreed that cell and gene therapy developers need to look beyond cancer. In gene therapy, he said, he is excited about the potential for intravitreal delivery of viral vectors that can get into the back of the eye. As for cell therapy startups, Rivers added, “I really like to get more involved in cell therapy in autoimmune disease.